There’s an Uncle Dave at every party, wedding or corporate event. He’s the mickey taker, the Jack the lad or, as we magicians call them, “the pain in the arse” (we’re very gifted with words!). For most people, this would be their worst nightmare – dealing with a semi-hostile spectator, but it’s one of the parts of my job that I love the most, as it gives me more chance to create more of what I love – unique, genuinely funny, interactions with YOUR guests. That’s right, Uncle Dave’s don’t get in the way of the magic – THEY HELP IT ALONG! Like the stooge in the pantomime audience, yelling “your career’s behind you” at the stars on stage, Uncle Dave helps break the ice for the other guests. He eases the tension by showing them that it’s OK to play along. He says, “Don’t sit quietly on your hands – JOIN IN!” (though it’s usually more slurred than that. And littered with swear words). …I don’t care if the magic works or not. I’d happily blow the ending of a magic trick if it got everyone in the group laughing. I don’t care if Uncle Dave grabs the cards, my sleeves or my underwear (actually, I probably would care about that, as I’m down to my last three pairs). As long as I’m holding a pack of cards and everyone around me is laughing and having a fabulous time, who cares what I’m doing? It’s not arty, creative or clever, but it’s true. 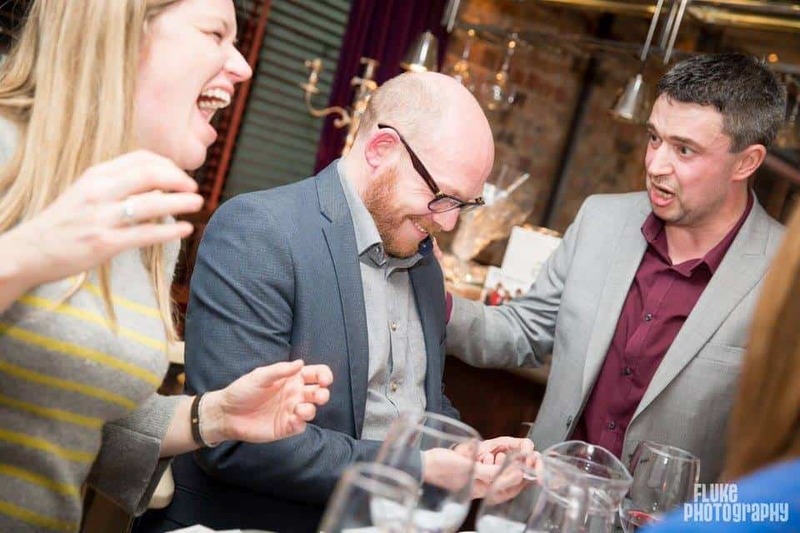 Let’s be honest, if you’re booking a magician for an event, are you really booking her to do a specific type or number of tricks for each guest, or are you booking her because you want to make sure that everyone has a fabulously fun night, laughing all the way through, while you sit back, relax and enjoy YOUR party? Get people laughing and they’ll love you forever…or until next Thursday at least. If you want to see what real people have said about me, and how my magic made their guests laugh until one of their socks fell off, you can click this button! So don’t worry about Uncle Dave…or Auntie Margaret or that “special” cousin. Don’t apologise for them or warn them off the magician (that only usually makes things worse anyway – it’s like a lion spying a wounded antelope, covered in BBQ sauce, handily lying next to a refreshing glass of water). Bring them forward – let them get involved. I’ll win him over and get him laughing. Uncle Dave won’t ruin your special day – he could be the making of it!